OMEGA’s PX5000 Series pressure transducer has earned a reputation for high performance, reliability and stability in tough, real-world applications. 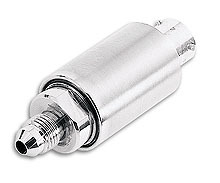 This outstanding transducer uses OMEGA’s advanced sputtered thin-film sensor technology. In the sputtering process, gage material is accelerated in a vacuum chamber toward a sensor substrate, molecule by molecule. They impact with an energy of several thousand electron volts - sufficient to penetrate a few atomic layers and produce the most stable and reliable bond possible. This unique molecular gage bonding provides superior long-term calibration stability and reliability, since the sensors have no cement bonds to degrade with time, or weakened at higher temperatures. The PX5000 transducer excels in tough operating environments. The photo-etched gage pattern makes the sensing element components very small, with short interconnecting leads. This micro-geometry reduces vibration mass, making this transducer much less susceptible to vibration and shock failures and errors. Rugged all-welded construction ensures a durable and reliable instrument. And, this transducer now provides Electrostatic Discharge (ESD) protection to 15kV. You get state-of-the-art thin-film reliability and performance with the PX5000 pressure transducer, yet it is competitively priced. The result is highest value - premium performance without paying a premium price. This transducer is also available with an optional 11 point NIST traceable calibration. Burst Pressure: 3.0 times rated pressure or 20,000 psi whichever is less, will not cause rupture of the pressure containment cavity.